Go light, go fast, go far! 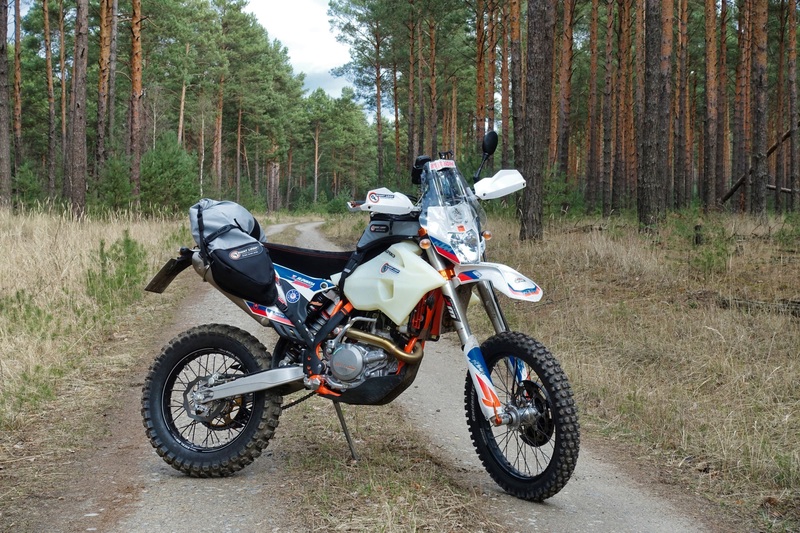 Finding the best luggage for the KTM 450 EXC Adventure build for my purpose of light travel was quite an easy task. My preferred luggage is simple, robust, has not thousands of straps, features and possibilities that I don’t need and are mostly hindering, when out living the trail life. After several years of experience with different kinds of soft luggage, I eventually wanted go with Giant Loop this time, as they exactly build this philosophy into their products. On the Enduro and Hard Enduro luggage market air get’s thin, as there are not that many players manufacturing slim-fit saddlebags. Giant Loop is one of them and I was lucky to get offered great support. Thank you folks! As main sink for carrying luggage, I chose the Coyote Saddlebag Roll Top. With its 39 l packable volume, rugged and proof build, I hope it will serve me well for a long time. It’s claimed to be water resistant (not water proof) but in my tests it always kept the water outside perfectly. It comes with a set of 3 RF welded waterproof inner liner Saddlebag Dry Pods with air release valves included. These turn out to very effectively pack up gear and cloth and as a side effect are 100% water proof. It’s exactly what I was looking for. A minimalist travel approach needs minimalist gear. Worth to mention is; compared to the XR, the capabilities of the EXC carrying luggage are outstanding. I never thought of it working so well. The subframe of the 2016 model is easily strong enough to carry all the gear I need. Installing the saddlebag is straightforward and I never had a better fitting one before, to be honest. For mounting the bag to the front-end, I used the Giant Loop Mounts. The best mounting point for me was to bolt them on to the main subframe mount. To make them fit tightly, I replaced the KTM subframe stock bolts with flat head ones and added proper washers. The mounts themselves, I bend just a little bit more towards the frame, to make them more flat and prevent possible catch with boots. On the right side of the bike, I had to cut the plastic frame protector to make the mount fit perfectly. I really like them as it makes it easy and fast to hook up the straps. In the past this always was fiddling and hurting fingers, sometimes doing this multiple times a day, when travelling with XR. Mounting on the rear-end, Giant Loop suggests two options — use the included fender hooks or the included webbing anchor strap to fit virtually any bike or tail rack. Both of the options do work. I decided against the latter one because when traveling I want to be able to quickly remove the saddlebag. Let’s say when finding a hostel for the night, I’d always want to take the saddlebag with me. This leaves me with the former suggestion, the included hooks. They do work well, but did not grab perfectly under the tail of the EXC for me, reason being my tall seat. The seat stops the bag from moving towards the rider (as it’s higher than the tail) , a nice feature but also stops the hooks from grabbing nicely under the tail when tying down the straps to the front. The good news is that the rear-end mounting straps are assembled inside the bag and they are built to be replaceable. This means you can put any type of strap into the saddlebag and find your own mounting solution. What I did was hooking up some left over Rok straps inside the bag, as they provide clamps, to be quickly released when needed. I pull the straps completely around the tail hooking them up on top before tightening them. This way the rear-end mounting fits super tight and strong and you could lift the bike easily only with bag. To prevent damage from exhaust heat, Giant Loop provides a Hot Springs Heat Shield (laser-cut aluminum) plus stainless steel clamp. I chose Giant Loop’s Diablo Pro Tank Bag providing 4 liters of packable volume. Coming from Enduristan 4X tank bag mounted on the XR, this one is huge. The 20 l Acerbis fuel tank on the EXC being so flat, compared to the one I had on the XR, allows for easily mounting a tank bag of this size though. It’s not in my way while either standing or sitting and provides loads of storage options. It’s perfectly thought through and installs like a charm. As the Coyote saddlebag it comes with a waterproof dry pod liner inner bag. From my experience so far, the bag itself is as water resistant as it can get, everything bone dry after lots of water collision. One feature I really like is the big zipper that let’s you remove the bag easily from the harness. This is very useful for the obligatory overnight-stay disassemble as well as necessary for the fuel stop. The bag and its harness aligns really nice around fuel tank cap and holds down bomb-proof when riding the gnarly stuff. For carrying oil or spare tubes, I attached two Giant Loop Possible Pouches to the Coyote saddlebag with a volume of 3.5 l each. I planned to use an additional dry bag on top of the Coyote saddlebag but after first tests it seems I do not need any more storage capacity, let’s see. The Coyote fits all my gear including spare parts, tools and camping equipment, like shown in the pictures. I like leaving extra space in my luggage to carry food or any necessities that come up during travel. For me it’s crucial not to fully use the maximum storage capacity. Packing your bags tight and clever at home, in most of the cases won’t work on the daily road life, so my experience. For the extra fuel capacity, I’ll carry a 2 gallon Gas Bag Fuel Safe Bladder. This mostly will be carried empty but gives me the additional piece of mind when riding remote areas. The bladder will be strapped down on top of the Coyote saddlebag. The luggage options are completed with my Ortlieb Packman Pro Two backpack. This bag also incorporates the philosophy of light, simple and robust. The waterproof 25 l backpack features a roll closure with compression straps for packing and compressed volume. It also has the option of carrying a drinking bladder. Most of the time it will be used for carrying water, food and my drinking bladder and meant to be as a additional storage capacity, staying as empty and light as possible. Carrying too much weight on back does not let me comfortably manoeuver the bike and is simply not for me. Which concludes to a theoretical total volume of 75 l.